Scientists have decoded faint distortions in the patterns of the universe's earliest light to map huge tubelike structures invisible to our eyes – known as filaments – that serve as superhighways for delivering matter to dense hubs such as galaxy clusters. The international science team, which included researchers from the Department of Energy's Lawrence Berkeley National Laboratory (Berkeley Lab) and UC Berkeley, analyzed data from past sky surveys using sophisticated image-recognition technology to home in on the gravity-based effects that identify the shapes of these filaments. They also used models and theories about the filaments to help guide and interpret their analysis. Filament properties could also put gravity theories to the test, including Einstein's theory of general relativity, and lend important clues to help solve an apparent mismatch in the amount of visible matter predicted to exist in the universe – the "missing baryon problem." "Usually researchers don't study these filaments directly – they look at galaxies in observations," said Shirley Ho, a senior scientist at Berkeley Lab and Cooper-Siegel associate professor of physics at Carnegie Mellon University who led the study. "We used the same methods to find the filaments that Yahoo and Google use for image recognition, like recognizing the names of street signs or finding cats in photographs." The study used data from the Baryon Oscillation Spectroscopic Survey, or BOSS, an Earth-based sky survey that captured light from about 1.5 million galaxies to study the universe's expansion and the patterned distribution of matter in the universe set in motion by the propagation of sound waves, or "baryonic acoustic oscillations," rippling in the early universe. 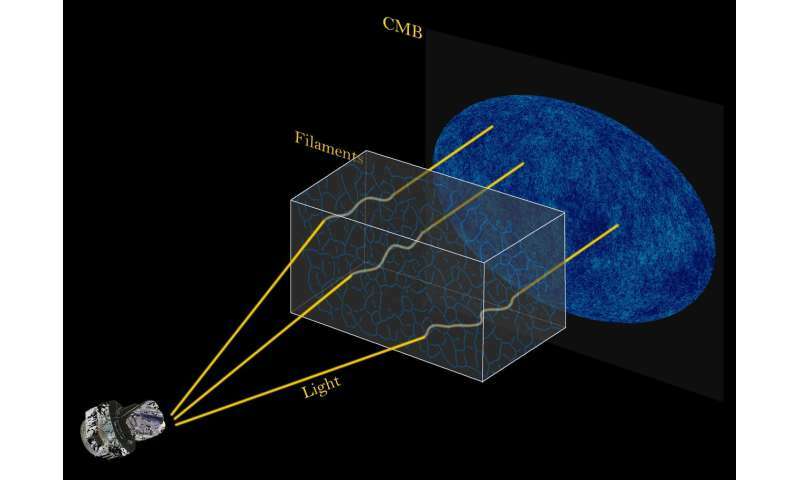 "We knew that these filaments should also cause a deflection of CMB and would also produce a measurable weak gravitational lensing signal," said Siyu He, the study's lead author who is a Ph.D. researcher from Carnegie Mellon University – she is now at Berkeley Lab and is also affiliated with UC Berkeley. The research team used statistical techniques to identify and compare the "ridges," or points of higher density that theories informed them would point to the presence of filaments. "We were not just trying to 'connect the dots' – we were trying to find these ridges in the density, the local maximum points in density," she said. They checked their findings with other filament and galaxy cluster data, and with "mocks," or simulated filaments based on observations and theories. The team used large cosmological simulations generated at Berkeley Lab's National Energy Research Scientific Computing Center (NERSC), for example, to check for errors in their measurements. "Filaments are this integral part of the cosmic web, though it's unclear what is the relationship between the underlying dark matter and the filaments," and that was a primary motivation for the study, said Simone Ferraro, one of the study's authors who is a Miller postdoctoral fellow at UC Berkeley's Center for Cosmological Physics. Siyu He said that resolving the filament structure can also provide clues to the properties and contents of the voids in space around the filaments, and "help with other theories that are modifications of general relativity," she said. Ho added, "We can also maybe use these filaments to constrain dark energy – their length and width may tell us something about dark energy's parameters." LOL! Those "tube-like" structures which deliver matter and energy throughout the Universe are electric Birkeland currents. The filamentary and cellular nature of the Universe was predicted about 80-years ago by Alfvén, and it has zilch to do with DM faerie dust. Who Still Denies Electric Currents in Space? No one denies electric currents in space. What can be argued is the proportional energetic contribution of those "electric currents". These "tubes" are NOT electric Birkeland currents. They are gravitational facsimile of Birkeland currents. Now we're making maps of the filaments; this is the second article I've seen on it in the past couple months. A Japanese-led team has done much the same but their work is more accessible because of the graphics. This map goes from zero (Earth) to about z=0.7, about 9.6 billion light years. These guys here need to get a better graphic artist so we can see a semi-isometric projection and get an idea what this looks like. Ideally they'd make a solid map and then rotate it, zoom in, rotate some more, etc. The video is nice but it's not topical; it's a simulation. Readers shouldn't get the idea that the data in the first image with the blue, violet, magenta, and red filaments is a simulation; these are actual measurements and this is real data, not a simulation. The universe is not only strange, but is stranger than we can imagine......Einstein. Let us suppose that there is differential expansion, where spatial density is related by the calculus of discontinuous multivariable partial differential equations of man degrees. Take supercomputer! A realllllly big one! Says "no one" denies electric currents, then does just that in favor of a hypothetical concept that requires faerie dust to make it happen. No thanks Whyde, I prefer real science to your faerie tales. Nope, you prefer looks like a bunny 'science'. Show the evidence that these filaments are electric currents. They've been studied for long enough. They have been studied for years by plasma ignoramuses such as yourself, people who believe the magnetic fields are frozen-in to the plasma. Enough said! Cosmic Web Reconstruction through Density Ridges: Catalogue. That information is publicly available. Anyone can obtain it and work on it. Sadly for the EUists, they have nobody sufficiently skilled to be able to do anything with it. So they just make s*** up. These structures are much larger - they span billions light years and whole galactic clusters and quasar groups. It's not a problem Zephyr, plasma processes are scalable. All the way up, all the way down. I've posted the links time and again jonesdumb, you are only blinded by your own ignorance. You're just too old to learn anymore, you have far too much BS cluttering your brain cell for there to be any additional information to be absorbed. Maybe thar's why you keep forgetting, your brain cell reinforcing the old be quickly forgetting the new. It's an old mind you have, for the short time you have left. What links? There are no galaxy spanning currents, they would be bleeding obvious, therefore you are lying when you say you've linked to such. The above researchers are finding them using the technique described, but the effects are electromagnetic as is gravity. Nope. Neither of those statements is true, nor is there the slightest evidence to back them up. Expound on gravity being electromagnetic, please. Ahhh, this is likely due to the pronouncements of EU woomeister-in-chief Wal Thornhill. He has been scratching around for decades, trying to construct a universe in which his idol Velikovsky's physics defying woo is possible. Given that the laws of physics disallow such things as Venus doing handbrake turns around the solar system a week last Tuesday, possibly around the same time Earth was orbiting Saturn, then he needs to amend said laws. So, armed with his Bachelors degree in physics and computing, he is trying to convince his merry band of scientifically illiterate followers that he has done just that. Complete bobbins, of course, but that lot will believe pretty much anything. Let us suppose that there is differential expansion, where spatial density is related by the calculus of discontinuous multivariable partial differential equations of man degrees. You do like to string random words together in a meaningless jumble, don't you? Most of science believes in cosmic expansion most of the time, with is corresponding mass emerging out the quantum fluctuations. The implication as the cosmic expansion is a incremental process, mass emerging out the quantum fluctuations is proportional to the cosmic expansion radius R=2GM/C* To maintain cosmic expansion, mass continues to emerge from the quantum fluctuations, the flawed darkmatter hypotheses is actually the matter emerging out the quantum fluctuations as it has been doing for the past 15billion years. This was not my idea, the blame lies fairly and squarely at the feet of who ever proposed in the primordial soup 15Billion years ago matter emerged from the quantum fluctuations as it continues to this present day! Mathematically a centre has coordinates spatially they are just coordinates in space, the cosmic expansion has a radius and therefore a centre, but where in the vacuum of space our cosmic expansion radius is located is not the same as the coordinates of where you live like a postcode. Give the postie your postcode and he drive from any planet in the solar system to your letter box because all coordinates are relative to earth. To provide a location for our cosmic radius location you have a relative fixed point in space as the planets are relative to earth but where earth is located in the vacuum of space is same as where is the cosmic radius is located. Radius is defined by center, where the center is (supposed to be)? What the M and C constants are? mackita> Radius is defined by centre, where the centre is (supposed to be)? What the M and C constants are? There's tenuous filamentary material stretching between galaxies, viewed at a distance galaxies appear honey combed, charged particles, cosmic rays, electrons any these can pass though tenuous filaments. OK, so that these filaments are plasma - but what next? Just because they're is scalable, you cannot predict nothing testable from it: it's interpretative model in similar way like God hypothesis - not predictive one. That is exactly wrong. Alfvén predicted the filamentary/cellular nature of the Universe in 1937 by applying the known properties of plasmas from laboratory research. There need be only one force in nature, a proper understanding of electromagnetism will show that gravity, strong, and weak are all derivations of EM. ^^^^^^^Told you it was down to the idiot Thornhill. Of course such attempts to explain gravity electromagnetically have been made before, and are trivially shown to be wrong. Given that all we have is non-peer reviewed word salad on a crackpot website, then I think it can be safely ignored. And is. Also, as well as being pseudoscientific claptrap, the idiot Thornhill makes the claim the gravity must act instantaneously. and therefore cannot be restricted to the speed of light. The detection of GWs from a neutron star merger, along with the pretty much concurrent observation of the EM signature of the event, kill that silly argument stone dead. I always like how there is never any real math associated with the EU approach. It is mainly random quotes from people, the reader not knowing in what context they were speaking when the quote was delivered. I worked through Jackson's E&M book in grad school, so feel very confident in E&M theory and maths related to it, but have yet to see any worthwhile mathematical modeling of the "obvious" EU ways and how modern theory is wrong. If the strong force is E&M, show me how a neutron and a proton bind using only E&M. Thornhill makes the claim the gravity must act instantaneously. and therefore cannot be restricted to the speed of light. Right, because according to GR the Earth is orbiting the Sun where it was eight minutes ago. And Pluto is orbiting the Sun where it was 5+ hours ago. So Pluto is orbiting the Sun where it was about 250k miles ago... LOL! So you don't believe in systems travelling with a common velocity? Think of it as Group Velocity in E&M terms. That should be perfectly clear to you. Even if there is per your post a 250,000 mile difference with the system not travelling in unison, is Pluto's orbit perfectly circular? Does any planet perfectly orbit the Sun? also, let's do the math per your numbers. That stuff is obviously going to be so far beyond the likes of you and Thornhill, that there is little chance of dissuading you from the obvious and provably wrong nonsense you believe in. But at least try. They detected the return stroke of a fart einstein let go in 1915, then used some statistical gymnastics to claim it was a GW. No fanciful ripples is "spacetime" have been detected. Wrong. And yet again shows your monumental scientific illiteracy. I asked you to expound on it, not repeat it. And - why do you leave out the magnetic aspect? That not relevant to your EU perspective? Electrons travelling the tenuous galactic filaments, at 9.1x10-31kg x G have gravitational acceleration, so do quarks, photons and neutrinos which make up the protons which go on to make the stars. All the listed particles travel the filamentary galactic conduits between galaxies. 0ver the life time of a typical galaxy the total galactic mass in the form of the constituents of protons pass through these galactic filamentary conduits. The filamentary galactic conduits have the total mass of the galaxy over the life time of galaxy passing through them, being that gravity is proportional to mass; the filamentary conduits equal the total gravitational attraction of the galaxy over the life time of the galaxies. Quarks, electrons, photons, neutrinos and electromagnetism; flow through the billions of Lys of the matter of the vacuum of space. The galactic clouds of what we call dust, are actually constituents of the proton, quarks, electron, photons, neutrinos from which any atomic particle is constructed including kaons, pions, muons as electromagnetic radiation is a phenomena of the electric charge which the quarks and electron posses. The point is the clouds of matter that permeate the vacuum of space are from their very creation in the primordial soup are always linked together however tenuous the link, as there are trillions of centrally compressed cores of matter thinning to the neighbouring core, from where the quarks, electron, photons, neutrinos flow from one cloud to next, even over billions of light years! For those in denial of electric current! We as people are one massive electric currant of quarks and electrons in spinning motion. Electric currant is the phenomena of the electric field, the property of the quarks and electrons as the quarks and electrons have flowed through 15billion Lys of the vacuum of space, an electric charge flowing up to the speed of light is an electric currant multiplied by all the quarks and electrons the total mass the universe contains adds up to one almighty electric currant. The electric field in motion are the currants of the universe. We are held together by electrons sharing orbits by the forces of their magnetic fields, their magnetic field comes about by the electrons spin, spinning its electric field producing the electrons magnetic field. hunh... In my dictionary, a currant is a raisin. cute. Currants do provide electrolytes, don't they? What carries the electric field threw the universe? Matter, right? Tell me again how a sparsely matter populated area of space carries an electric field strong enough to effect matter transport...? Me personally prefer the currants in ribena, a truly electrifying refreshing drink. Does that make you irish, french or english? Our universe is expanding close to the speed of light as it has taking 15billion years to travel 15billion light years the matter contained within is travelling at the same velocity providing those tasty treats sufficient velocity for magnetic fields propelling matter along the tenuous filamentary interconnecting matter. being close to the isle of man a wine of irish and english extraction with a hint of french. Motion does not create magnetism. "Friction" does... Charge opposition. Only the light travels at that speed. providing those tasty treats sufficient velocity for magnetic fields propelling matter along the tenuous filamentary interconnecting matter. While the fields may travel at that velocity, they are subject to inverse square like everything else. THere needs to be sufficient density of matter/mass in interactive motion and proximity to generate the magnetism, which in turn generates electricity required to aid in the push/pull of matter/mass across the universe. Electric, magnetic fields combined with the gravitational fields the attraction of the tenuous filimentary sub atomic particles, increases gravities range increasing the flow of matter from one cloud or galaxy to the next. It is simply the the electric field of elecrons in motion in a vacuum in isolation, no friction is involved in the process produces the magnetic field. This is intriguing, are superconductors friction conductors maintaining continuous current flow in the absence of friction! Eric Laithwaite's magnetic river used in the film "The Spy who loved me" tested in the field by Sir Roger Moore! Whydening Gyre:- Taking into account superconductors and testing in the field by Sir Roger Moore, James never returns any equipment he borrows from Q, making it more challenging for you to give a more complete view on motion, magnetism, electric currents in the density of matter, there interactive motion and proximity to generate the magnetism, which in turn generates electricity required to aid in the push and pull of matter across the universe and their interaction of friction in frictionless contact environments. "Whydening Gyre> Motion does not create magnetism. "Friction" does... Charge opposition "